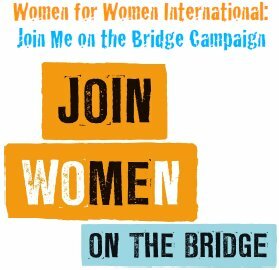 To honor the resilience of millions of women survivors of war around the world, Women for Women International is hosting a global campaign called Join me on the Bridge on and before International Women’s Day: March 6- 8, 2010. On March 8, 2010 we will bring women from Rwanda and Congo together in peace on a bridge between their two countries to demand an end to war and demonstrate that women can build bridges to peace and development. At the same time and during the preceding weekend, we will bring women (and men!) together throughout the world, creating a global movement that says NO to war and YES to peace and hope.